The dream of ranch ownership is real. 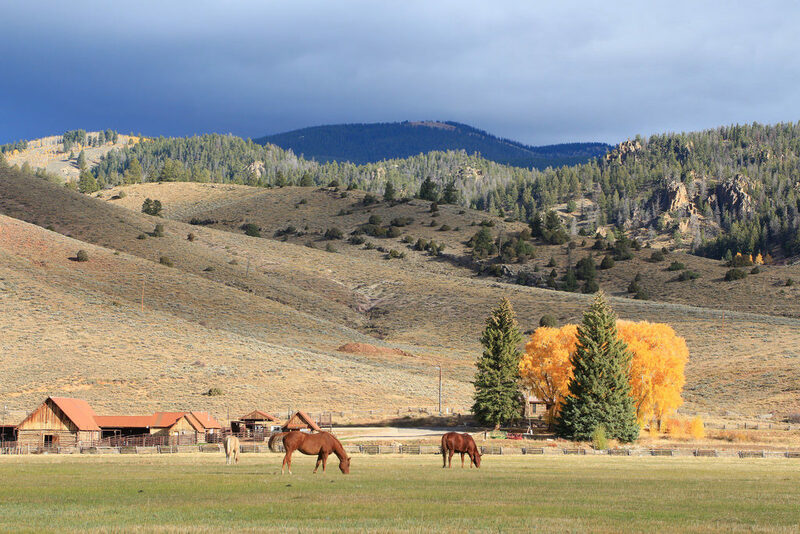 And steeped within the fabric of American West ranching is Wilder on the Taylor, an iconic Colorado ranch property sandwiched between Crested Butte and Gunnison with a lineage dating back to 1893. As the story goes, three young men filed claims for a parcel of 160-acre homesteads that year. Within five years they were granted ownership, and soon began occupying and working the land. Today, the sprawling Colorado ranch spans more than 2,100 acres along the Taylor River, offering a rare ownership opportunity for those looking to claim a slice of the good life in a thriving ranch community. Here we highlight five things to look for in a ranch community and uncover what makes Wilder on the Taylor so unique. Ranching experts say it’s important to ask yourself two questions: Is ranching an important facet of the local community? And what surrounds the ranch? In the Gunnison-Crested Butte Valley, for example, driving down Highway 50 and 135 will clearly show that ranching isn’t just a hobby, or a thing you do on the weekends. It’s a way of life. Being located in the heart of the Colorado Rocky Mountains gives Wilder on the Taylor unsurpassed beauty and epic mountain views, with the benefit of being positioned between two thriving towns, which feature an array of cultural attractions, conveniences, and recreational offerings. Responsible ranch owners will look at how the the land and surrounding environment has been cared for, both now and in years past. Since the late 1800s, Wilder on the Taylor has been owned and operated by dedicated families that have made it one of the most iconic and well cared for properties in all of Colorado. Don and Shelly Sabrowski have served as ranch managers since 1995 and work closely with Colorado Parks and Wildlife to preserve migration corridors for elk, bighorn sheep, deer, and other wildlife. Additionally, the building envelopes for each and every homestead were carefully chosen to respect the integrity of the ranch and these corridors. And when it comes to the rivers and streams, Master Fishing Guide Lu Warner keeps a close eye on the health of all waterways. History is a big factor in the prestige and profitability of ranch ownership. Wilder on the Taylor says there should be a current running through the ranch that plugs it into the past while also providing ways to continue its legacy into the future. A recently published Wilder on the Taylor history book – which is being covered in a series of articles on Wilder’s website – offers a glimpse at the captivating stories of each of the ranch families who have owned the land and lived at Wilder on the Taylor over the years. In fact, each family that purchases a homestead at Wilder on the Taylor receives the book and a fireplace tool with Wilder’s brand, and are encouraged to build rich legacies of their own at the ranch. This is a biggie, folks. What does the ranch community have to offer? What activities, services, wildlife, and outdoor recreation does the property afford? Two of Wilder on the Taylor’s greatest strengths are its private fishing waters and extensive trails. Located on property and nearby for exploring, these prompted the appointments of experts like Warner, who serves as a master guide for fishing and mountain biking. Owner, Don Sabrowski, is a master guide for cattle roundups and trail rides. Concierge/Chef Elena Marquez is available to prepare meals, coordinate transportation from the Gunnison-Crested Butte Regional Airport, and handle grocery stocking for arrivals. In addition, she provides area expertise, ranging from information on local events to the best restaurants and shopping. She also manages reservations for the four well-appointed riverfront cabins, which owners can use when building their homes at Wilder on the Taylor. They can also be used for overflow when hosting family and friends. Combined with a base camp area for relaxing, mingling, and hosting get-togethers, Wilder’s amenities can’t be beat! What is more important than community? Typically when buying into the ranch life, you want to do your homework to see if the ranch is a good citizen, and offers a sense of community among owners. Of course at Wilder on the Taylor, Thursday Nights are reserved for summer get-togethers at base camp for cocktails, appetizers, a fabulous dinner and conversation. These evenings have led to many friendships, business discussions, and outings to fish, hike and ride the trails. But Wilder on the Taylor takes it a step further. They are involved in several philanthropic causes, such as annually hosting wounded soldiers and military veterans through the Fort Carson chapter of Project Healing Waters Fly Fishing; welcoming wounded warrior groups; providing fund-raising auction packages for the Adaptive Sports Center in Crested Butte; and serving as a venue for several Tour de Forks dinners for the Crested Butte Center for the Arts. The main takeaway? Do some digging. Get to know the ranch’s roots. Learn about its legacy, its stewardship, its community. Look beyond the flash, and dive into its past, present, future. Luckily with Wilder on the Taylor, they’ve done all the work for you. To find out more about Wilder on the Taylor and Crested Butte land for sale, visit www.WilderColorado.com. Wilder on the Taylor is an angling paradise and a recreational and preservation-oriented ranch community located on more than 2,100 acres. The historic cattle and hay ranch is conveniently situated on County Highway 742 between Gunnison and Crested Butte and surrounded by the Colorado Rocky Mountains. Each homestead is a minimum of 35 acres and has access to miles of private fishing water and trails, master guides, concierge services and a base camp for dining, relaxing and socializing. Wilder is dedicated to preserving, protecting and perpetuating the traditions of western Colorado. For additional information, follow @WilderColorado on Facebook and Instagram. We love to travel to Crested Butte every summer and have heard great things about Wilder on the Taylor!